Fujitsu today announced the release of ARROWS Tab Wi-Fi, a new tablet PC targeted toward consumers in the ARROWS series of tablets and smartphones. The ARROWS Tab Wi-Fi is equipped with a fingerprint sensor and is IPX5/7 water-resistant. It can be used in places near water, such as in bath areas or the kitchen, as well as outdoors, further enhancing usability. The ARROWS Tab Wi-Fi Tablet’s built-in camera can recognize hand gestures for operation even without directly touching the screen. As a result, smooth operation of the tablet PC is possible when preparing food and the user’s hands are not clean, or even when in the bathtub and user’s hands are wet. With the touch panel’s special surface processing, called Super Glide Coating, users can glide their way through the tablet’s touch panel operations. In addition to high-speed Wi-Fi data communications, it is equipped with other leading-edge specs, such as a high-speed and high-efficiency OMAP4 (1GHz) high-speed, high-performance dual core CPU,DLNA support, and a highly responsive Saku-Saku Touchpanel. Also, while it employs a lightweight, slim body design, it features a 10.1 inch large screen display and Dolby Mobile v3 front speakers, so it is possible to fully enjoy video entertainment. Furthermore, in connecting to other PCs, the ARROWS Tab Wi-Fi is standard equipped with an F-Link wireless data exchange application. As a Made in Japan product, the tablet meets high-quality and high-reliability manufacturing standards. The new tablet measures 181 × 262 × 11.3 mm and weigh 599g. 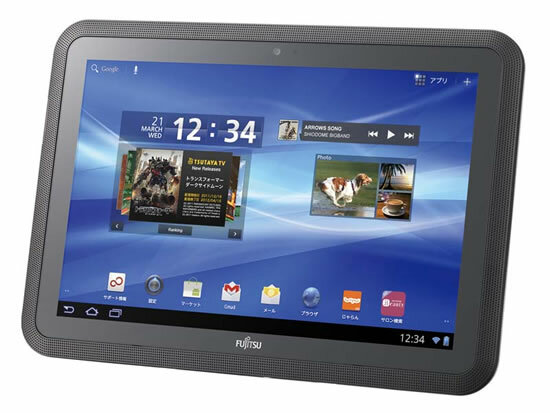 The Tablet will be available for purchase throughout Japan in consumer electronics stores as well as Fujitsu’s WEB MART shopping service site from January 19th.